If, like me, you're a lover of Soviet aircraft, and in particular Soviet transport aircraft, then you absolutely must get this book! 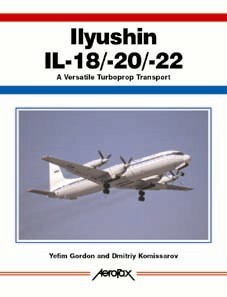 Authors Gordon and Komissarov obviously know and love the Il-18 and its many variants and derivatives, and it shows in the quality of both text and photos in their impressive book. The Il-18 is often given the label of "the Soviet Electra," and while there are broad similarities between the two types, in terms of commercial success and longevity, the Il-18 far surpassed its Lockheed rival. With over 500 built up through 1969, the Il-18 outnumbered the Electra nearly five to one. Perhaps only in the area of passenger comfort and conveniences (not Aeroflot's main priority in the 1950s) did the Lockheed product outshine the Il-18. If you've seen the basic format of the other books in the Aerofax series, this one will look familiar. Separate chapters cover the ancestry of the Il-18, development, technical data, variants, and service use. They go into great detail on the many detail differences between the various versions (surprisingly numerous, to me), as well as providing a wealth of information on the main offshoot version, the Il-38 May ASW aircraft. Chapters covering the research uses of Il-18s, the Il-20 ELINT version, and the Il-22 ABNCP versions were particularly enlightening to me. The sheer number of one-off research aircraft is astounding, ranking up there with the ubiquitous C-135 in this department! Photos are generally well chosen, and very well reproduced. The majority are black & white, while a separate section of color images is provided at the end of the book. The authors seem to have been able to uncover un-retouched photos of the early prototypes and production aircraft, something that seems difficult to do for many Soviet types. The photos are supplemented with outstanding line drawings of numerous variants, including five-views of some of the major ones. There are tables showing airline operators of the Il-18, including construction numbers, registrations, dates, and fates (where known): an excellent reference for tracking the history of a given airframe. Overall a very impressive work on a relatively obscure type to many Western enthusiasts.